Good workout shoes, good investment. When I started my weight loss journey after giving birth to my second baby, i was always working out at home without shoes because, i thought to myself; "whats the point of wearing shoes when i'm indoors"? It was really uncomfortable i swear, my toes hurt a lot and i couldn't really jump the 'jumping jacks'. But i still managed to continue. One day, i complained about the pain and a friend asked me if i was using workout shoes to exercise and i said "no of course". She asked me get a pair quickly. I went to the market the next day and got some and i tell you the difference was clear. I stopped feeling the pain on my toes and heels, exercising in general felt better to do. There are many affordable sports shoes in the market. From N3000 you can get a good one. If you can afford the branded ones please go ahead and get them, they are even more comfy and light. You wont feel a thing i promise you. This is one thing i would recommend for you to invest in. Be sure of what you are buying because there are different types for different sports. 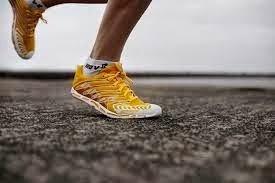 A running shoe isn't the same as a walking shoe. Although there are some that you can use for both. Be sure to buy a well padded kind. Keep your shoes well and don't let them get wet. Always use socks with your shoes for extra comfort. Don't forget to get your size. I like mine a size bigger anyways. Look on the bright side, the better the shoes(quality wise), the longer they last right? If you don't use workout shoes to workout, you are wroonggggg!!! Lol. Rush and get yours now, for your own good. Again, so that you can get the best of your workouts. Take care. God bless.